This is the story of a 2/3rds empty bottle of Champagne (or, to be precise, German Sekt) that was sitting in our fridge until earlier today. Like all good stories, I won’t reveal if this has a happy or a sad ending for the Sekt until the end of the tale. Its owner, feeling that too much alcohol imbibed over the course of Christmas festivities surely couldn’t be the best thing for her health or sanity, decided that Something Must Be Done To Get Rid of It In a Satisfactory Way. The easiest option was, of course, simply to down the rest and be done with it. Surely that would meet with the approval of its other owner, who has more than once commented that his girlfriend is easier to handle after a glass of vino. (I don’t necessarily mean physically of course, merely that she’s more likely to agree with whatever he’s saying at the time. ‘Dragon Age’? Of course you can play it all day and all night!). However, a long-gone but very persistent author by the name of Isabella Beeton wasn’t going to let the Sekt end its days so ignominiously. The words ‘Champagne Jelly’ flitted tantalisingly, yet mysteriously, past the girlfriend’s eyes as she scrolled through Household Management’s online version (www.mrsbeeton.com. And no, I don’t get kick-backs for promoting this site!). I say mysteriously, because Mrs Beeton gives no recipe for Champagne Jelly, although she mentions it at least twice in her mighty tome. Using logical deduction and sound reasoning, the girlfriend put two-and-three together and got five. Or at least, a simple but hopefully accurate recipe. 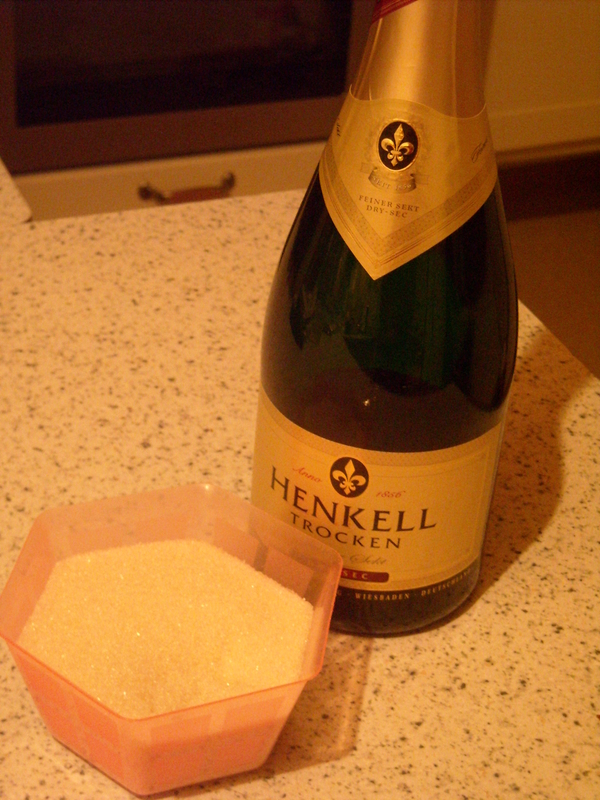 Champagne Jelly: For every 1 lb of Champagne / Sekt / similar beverage, combine with 3/4 lb sugar. 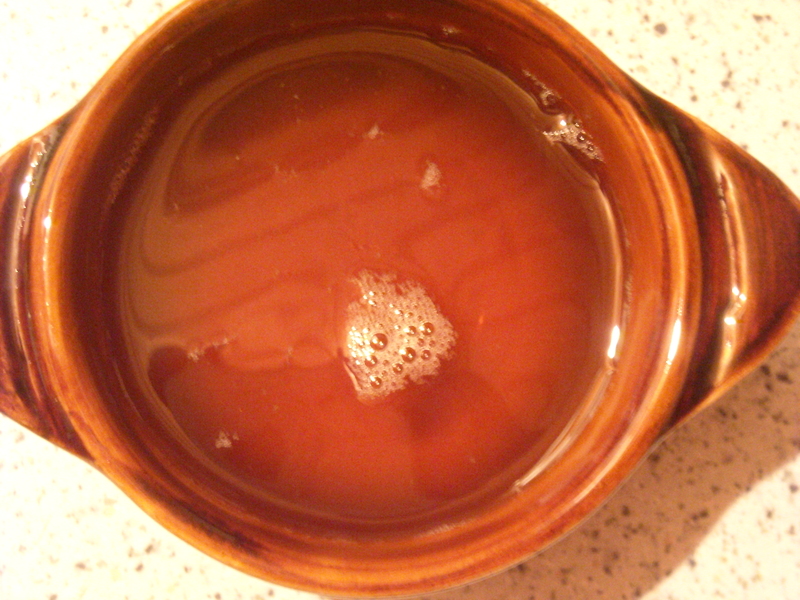 Simmer both together over a medium-to-low heat until somewhat reduced and thickened (approximately 1 hour). Chill in the refrigerator for 2-3 hours until set. Serve. 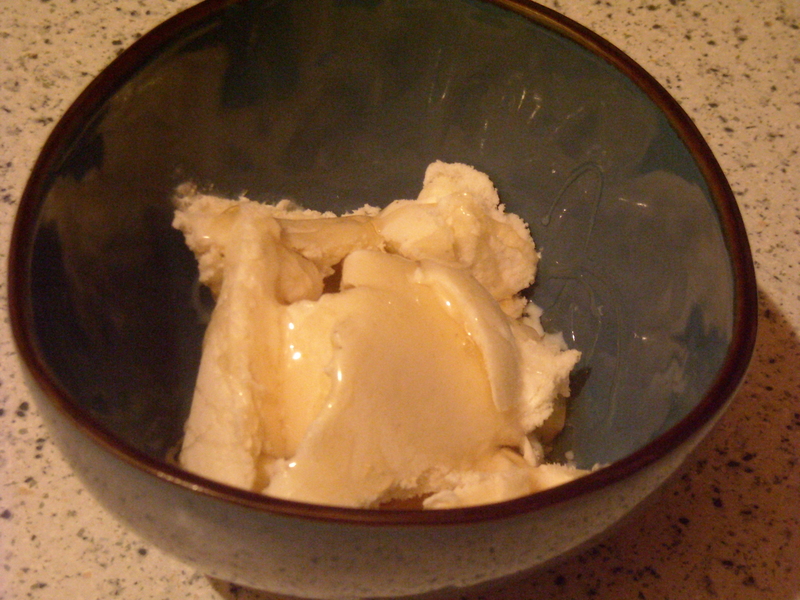 The clever girlfriend realised that her boyfriend could be persuaded to try this dish if accompanied by something else he simply can’t resist – ice-cream. She poured a little over the creamy dessert and presented it to him. With bated breath, she enquired as to his opinion. “It’s ice-creamy I guess,” he replied. “It’s good.” And so thought she. Although best described as a syrup rather than a jelly, it adds a rather sweet and, well, syrupy, dollop of tastiness to a humble bowl of vanilla ice-cream. And so they all lived happily ever after. Except for the 1/3rd bottle of Sekt, of course. The next post will appear at the beginning of January 2010. Subscribe (see options on the right) to receive instant notifications about blog updates. This entry was posted on December 28, 2009 at 11:06 pm and is filed under Christmas, food. You can follow any responses to this entry through the RSS 2.0 feed. You can leave a response, or trackback from your own site.